As lovers of the outdoors, hikers and backpackers alike have a close, almost reverential relationship with the sun. We love spending our days under the warmth of it’s rays, we use the sun for navigation, we plan our excursions around sunrise and sunset. Our connection to the sun when we are outdoors is as tied to our survival as the air we breathe and the water we drink. It is only fitting that the first posture (or asana) sequence we will review for Yoga Practice for Hikers is the Surya Namaskar, or Sun Salutation. 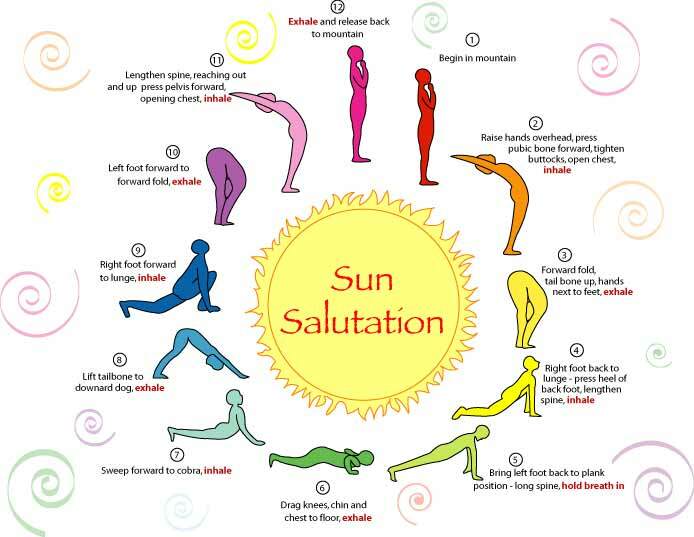 According to many authorities, the Sun Salutation goes back over 2,500 years to Vedic times when it was used as ritual prostration to honor the dawn. Tradition was to perform the ritual salutation outdoors, facing the sun for a complete 108 cycles. This is a great sequence for practice outdoors because you are mostly on your hands and feet and it can be practiced with, or without, a mat. Find a nice quiet place, free from distraction, on relatively level ground with room for the length of your body to stretch out. Your hands will be supporting your weight at points, so make sure the ground around you is free of sharp objects that may hurt your palms. If practicing in the morning, it is tradition to face east toward the rising sun. Inhale and move your right foot back, knee touching the floor (Lunge). In pause between breaths, move your left foot back, both knees on the floor (or into Plank Position). Exhale and lower your chest and nose to the mat (Chaturanga or Four-Limbed Staff Pose). Inhale and lower pelvis while pushing the chest up, arms straight and shoulders back (Cobra Position). Exhale and raise your tailbone, straightening your arms and legs, pushing your chest toward your thighs and your heals toward the ground (Downward Dog Position). Inhale and bring your right foot forward again, left knee to the ground (Lunge). Exhale and bring your feet together, hands on the floor on either side of your feet (Forward Fold Position). Inhale and with a straight back, slowly bring your hands up above your head, shoulders back, pelvis forward (Forward Salute Pose). Exhale and return to starting position (Mountain Pose). Repeat these steps with your left foot for one full cycle. Complete at least 3 cycles. 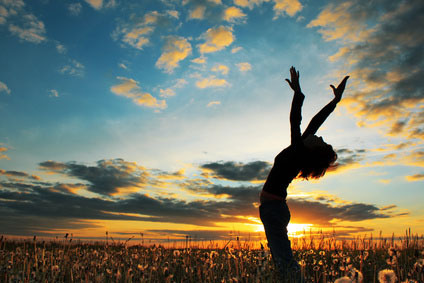 You can repeat your Sun Salutations for as long as you like, until your body feels warm, relaxed and flexible. There are many variations of this asana, but the point is to master breathing through the movements and practicing proper form. Do not move so fast as to allow sloppy posture, or so slow that you can not breathe in sequence with the movements. You should feel the full stretch of each position before allowing yourself to transition to the next one. This asana is a fantastic full-body warm up and is often used at the beginning of many Yoga workouts to get the blood flowing, the muscles warmed up and the body ready for more advanced work. It is also a great sequence to practice first thing in the morning to wake the body and get the blood flowing after your night’s rest. Consider practicing this sequence in front of your tent after a night camping trail-side, or to loosen up your body after a long car ride to a remote trailhead. Thanks, Steve! So far the concept seems very well received. I plan to post at least one article a week promoting Yoga Practice for Hikers focusing on a specific asana or sequence. Then maybe once a month, put them together into a short workout. Really depends on my ability to start generating video! I always visit your website and I really love the content. Thank you for sharing such beneficial articles!